A completely new developed premium product that ensures cleaner power for your set. There are three compartments on the inside, provided with three new active materials and brought together in a stylish housing made from woven carbon and stabilised with black resin to suppress unwanted microphonie effects. This all works because we applied new discoveries in the field of high frequency noise suppression. That it works has also been demonstrated through measurements: suppressing high frequency noise leads to a more pleasant music rendering in the audio spectrum. – Analogue sound: immediately audible; not subtle! – Music is experienced as more natural and cleaner. – Remarkable improvements of the voice rendering; fuller sounds and less troublesome ‘S’ sounds. – In the power strip, where the equipment is also connected. – In the socket, where the equipment is also connected. – The wiring of the Triple AC Enhancer is solely connected to the grounding, which is absolutely safe. – The product does not contain any metals, ferrite or power filtering on the inside. – The Audiograde AC Connector belongs to the Akiko Audio brand. – Also available in a US version. – Carbon housing length: 160 mm. – Total length: 330 mm. 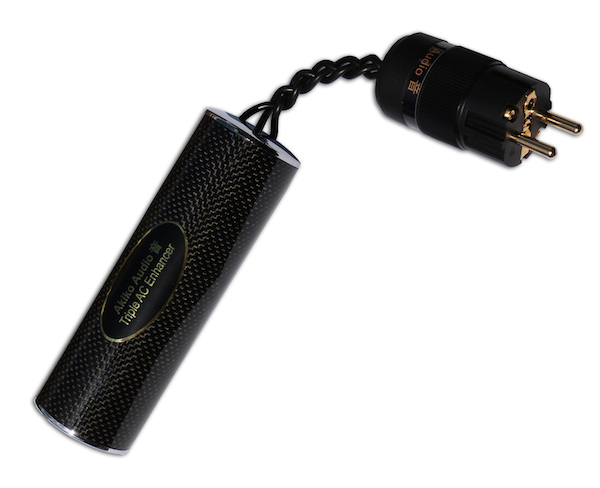 – The Triple AC Enhancer is the high end premium version of the Akiko Audio Tuning Stick AC. Thanks to our 14 days return policy you can try out everything at home.